Growing vegetables in indirect sunlight requires, first and foremost, that you choose vegetables that are tolerant of partial shade. The bad news is that most vegetables require full sun. The good news is that a small handful of vegetables do well in partial shade, making your choices somewhat easier. Many of the vegetables that do well in partial shade also prefer cooler weather, something to consider when you are planning your garden. Such vegetables become all but useless in hot weather. 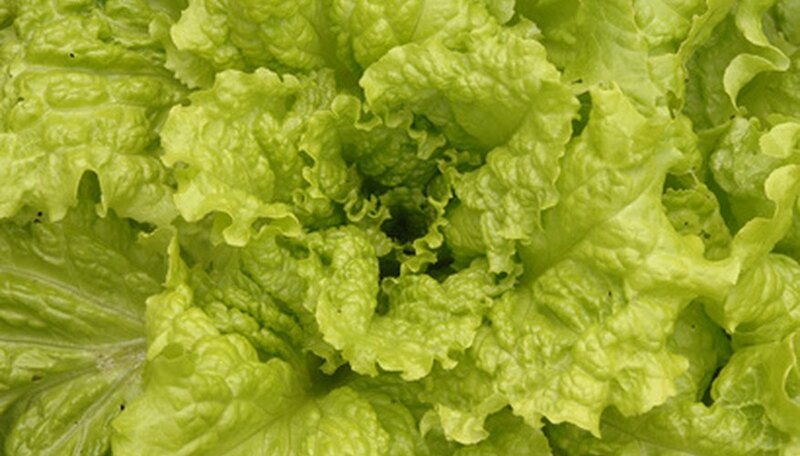 Leaf lettuce bolts (goes to seed and turns bitter) with temperatures in excess of 80 degrees F.
Choose varieties of vegetables that are tolerant of partial shade. Leaf lettuce, broccoli, cauliflower, salsify, rhubarb and members of the cabbage family all fit into this category. See Resources for a more complete list. Prepare the planting site a week to two weeks ahead of time. Dig compost into the soil in a 1:1 ratio, to a depth of 12 inches. Sow the vegetable seeds directly into the soil according to the package instructions. Some seeds, such as most lettuces, must be sown very shallowly. They require sunlight to germinate. Water the newly sown seeds carefully using a garden hose with an adjustable sprayer attachment. Set the sprayer to “mist,” so that you do not disturb the seeds or soil. It will take longer to water this way, but your plants will be better for it. Apply a good all-purpose vegetable fertilizer according to package instructions. If you are doing succession planting, and you previously had other plants planted where you are sowing your shade vegetables, you still must fertilize. Watch the soil to see when you need to water. The biggest difference between traditional full sun vegetable gardens and partial shade vegetable gardens is that you will not need to water as often. This makes it easy to over water. Do not water your shade vegetable until the top soil seems dry. Consider why your vegetables will be growing in indirect sunlight. If a building or other structure is shading them, that is different from growing vegetables directly underneath a tree. Pine trees are another matter, because the soil around them will be highly acidic, which most vegetables don't like. Rethink your plans if you intend to grow vegetable beneath a pine tree.